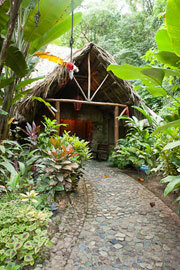 Property in the Panamanian Pacific coast, 7 hectares & 9,862.01 M2 or 19.7343 acres. Titled, with 168.19 meters (551.804 feet) of beach frontage and two entrances. Option to segregate 2 hectares 746.78 M2 (5.12664 acres) in 4 lots. Located in Pedasi, Province of Los Santos, PANAMA. Charm House in a private atmosphere and friendly nature. The property is completely enclosed by a bamboo fence that is reinforced by metal mesh and teak poles. Two electronic door access, complete inside and outside video surveillance and alarm system. A loft, 2 houses, 12 independent rooms, 5 gallery-type units, swimming pool overlooking the Pacific, three decks (two huts type) with direct access to the beach, a 130 m2 solarium, service house outside the private area, 9 roofed parking spaces, utility, laundry and guardian quarters. ALL FURNISHED! (including 19 A/C’s). 3 new units with open jacuzzi and a cambodian style house under construction (to be delivered July 2011) which will increase constructed area to over 3,000 M2. Several roofed utility parking. Timber, construction materials, tiles, machinery such as bobcat, tractors, etc...on site. Independent water system (3 wells with their respective pumps plus 5 reserve tanks totaling 210 M3 or 55,640 US Gallons), electricity (plus two back up power plants, one unit of 42KVa), internet and satellite communication. Plantation with 569 teak trees, a variety of native trees, thousand of palms and gardens of more than 15 years that add a unique beauty. The property has a Hotel license and a Government approved environmental impact study. Low maintenance, labor and utilities costs. Few places on earth exude eternal beauty like Dominica, located in the Eastern Caribbean, just a short hop south of Antigua, in between the two French islands of Guadeloupe to the North and Martinique to the South. Dominica, known as the Nature Island of the Caribbean, embraces a sense of serene and ageless beauty. Situated on beautiful Vancouver Island, a short flight from Vancouver or Seattle, the quaint fishing village of Bamfield plays host year round to fishing enthusiasts and nature lovers. Its proximity to the breathtaking Pacific Rim National Park and world famous West Coast Trail make the area a welcome destination for adventurers and vacationers alike. Located on the northern shoreline of the North Arm of Great Slave lake with Mackenzie Hwy #3 road access. Connected to NWT hydro power and phone lines. Building adjacent to tent frame cabin lodge accommodating 22 persons complete with fully equipped kitchen and conference cabin. Shower house with wood burning sauna. Two clay bathing sites at shore line. In The Beautiful Eastern Slopes Of The Canadian Rocky Mtns. McCracken Country Inn offers the comfort and privacy of a luxury hotel with the ambiance of an old country inn. 9 charming rooms featuring cable T.V., fireplaces, ensuite bathrooms, a/c., dvd players,fridges and guest rooms have queen size sealy posterpedic beds, tastfully decorated with antique furnishings.2 rooms have jetted jubs. This extremely large Hunting Guiding Area stretches throughout the North Caribou Mountains from Mc Bride Area to Wells, British Cloumbia and borders the world famous Bowron Lake Park. This guiding business was in family hands for over 40 years and encompasses licenses for 13 Moose per year, 3 Grizzly Bears(three year limit is 4)and no limit on Mountain Goat, Deer, Black Bear, Wolves and Coyote. 2nd cabin app 1000 sq ft.
All buildings surround your own spring fed private 40 acre lake. The Tweedsmuir Wilderness Ranch is located in a private bay on Ootsa Lake with 360 km of lake chain on your doorstep. British Columbia's largest Provincial Park, North Tweedsmuir Park is just across the lake with an access by water to the entrance of the Park. This is one of the most unique wilderness areas found anywhere in the world. The world re-known "Wells Gray Guest Ranch" is located 27km north of Highway 5, B.C. 's most traveled tourist route, approximately half way between Jasper and Vancouver. The Ranch is surrounded by the mountains of Wells Gray Provincial Park and it is the trailhead for about 100 km of trail through the park's rugged and protected wilderness. Log lodge beside alpine lake on the boundry of Banff and Kootenay National Parks . The cabin is fully funished in rustic log and the lake has been stocked with trout. Acess is by helicopter or 8 km. hike. There is no road acess. Power is supplied by solar and wind with a summer shower hot water heater( propane) is a shop with power tools and a 4 KW gas generator. The lodge is composed of 10 cabbins that can accomodate from 4 upto 10 persons per cabbin, restaurant, hiking trails, and other amenities for completelly enjoying an ecotorustic adventure. KATURA GARDEN is located in Barra de Guaratiba, in a 23.000 m2 green area between Grota Funda Montain and Marambaia's Sand Bank. ItÂ´s a new Inn, in a very unique, quite & safe area of Rio de Janeiro City, surrounded by a magnificent landscape, plenty of greenery, beaches, sand banks, fresh air, ecological walks and trails, boats tour and sea food restaurants. NOTE: We already have partial commitments for portions of this investment in conjuction with other operations we do in the area. This investment qualifies for some long term investment and tax incentives. 30 - 48% interest of an unique jungle resort / lodge in the Amazon for sale. 12 BEAUTIFULY LANDSCAPED ACRES WITH FLOWERS AND SHRUBS AT EVERY TURN OF THE HEAD. Walking Trails meander between various fruit and citrus trees. Totally surrounded by a 6' cinderblock wall without blocking the views. Construction consists of 15,021 square feet. Excellent facility for SPA, Weight Loss Retreat, Executive Addiction Center, Country Inn etc.. Discover The Ultimate In Country Living! Price just reduced!! No Real Estate Commission! Haus Martina has 7 luxury holiday apartments (including owner's flat)and it's located in the heart of the KitzbÃ¼heler Alps, only minutes to some of the best skiing and hiking areas in Austria. This is an investment opportunity not to miss. Chalet Piton is a huge ski chalet only 5 minutes from the centre of Meribel. Located in the tiny hamlet of Chandon, this charming and beautifully renovated barn conversion is south facing with amazing views of the valley. Well located in the French Alps, at only 30 km from the major city of Grenoble and at just 90 minutes from 2 airports with daily flights to England. The "Chalet des Alpages" is in the heart of the ski resort of chamrousse. There is a private courtyard with terraces & a covered 6m x 3m swinning pool. Each gite is newly furnished & equipped with New appliances. There are at least two bedrooms in each gite & two of which have three spacious bedrooms. In front of the mill is a tarmaced private parking area. Family own country hotel ideal to be converted into residential property or as a brilliant business opportunity. BASEMENT with full cellar, garage, toilets and multi functional room (ca 180sqm). GROUND floor with bar, dining room, professional kitchen and utility rooms (ca 220sqm). On the Northern shores of Lake Malawi, Central Africa, lies Chitimba Beach Lodge & Campsite. Chitimba is a village situated 90km south of the Malawi/Tanzania border Karonga, and 120km from the capital of the north, Mzuzu. The lodge is set on a beautiful golden sand beach, amongst banana palms and papaya trees, surrounded by the famous Livingstonia and Nyika mountains. Eco-Friendly Restored Old Inn In The Unspoilt Countryside. This property has been developed by the same owners over the last 26 years. The buildings are ideal for smaller conferences, courses or workshops,or just for people to stay and relax in great peace. The inn meets the exacting environmental standards of the "Nordic Ecolabel Hotels".